Paultons Welcome Area is Transformed! We’re pleased to have supplied a whole load of standing seam roof systems for the new Paultons Park Big Toy Shop, Wildwood’s Restaurant and Welcome Building during 2013 and 2014. Paultons Park has grown in popularity, particularly since the opening of Peppa Pig World at the park in 2010 and its continuing expansionist ambitions are typified by these latest developments. The Euroseam profile was supplied in aluminium as part of an Elite 4 guaranteed system, with complex and tight curves induced into the Euroseam sheet for smooth curves and clean lines; combined with crimp-curved steel liner sheets. The thermal efficiency of the insulated roof is very good, featuring a U-value of 0.17W/m2K. The specific Elite System installed was Elite 4.17. The ‘4’ designation referring to the type of construction (aluminium standing seam external profile and profile liner sheet) and the ‘.17’ refers to the U-Value (0.17W/m2K). Voted “Best park in the UK” by Mumsnet, Paultons has seen almost 3000m2 of Elite System 4 installed, with another phase of construction planned to start soon. Click here to see the time-lapse of construction. 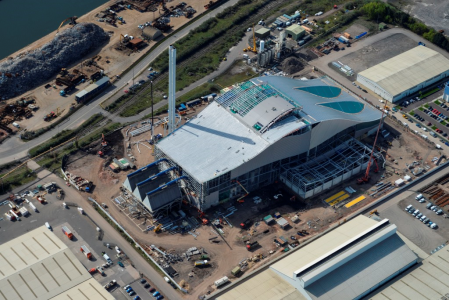 We are delighted to have been chosen to supply a raft of products for the new Trident Park Energy from Waste and Combined Heat and Power facility in Cardiff, being developed by Viridor, one of the UK’s leading recycling, renewable energy and waste management companies. More than 21,000m2 of Elite Plus 4 has been supplied for the roof and walls of the new plant, featuring a standing seam profile in stucco embossed plain mill aluminium, along with a thousand square metres of specialist Vieo roofing on the administration building, manufactured from Rheinzinc material. A feature wall is planned as part of phase 2 of construction, composed of a perforated standing seam exterior. The entire project has been designed predominantly to provide capacity for residual household waste with a proportion available for waste from local businesses. Specialist contractors MIZ are installing our products at the facility, which will be able to treat up to 350,000 tonnes per year of residual waste or post-recycling waste, generating around 30MW of electricity – enough to supply around 50,000 homes. Main contractor Lagan Construction began onsite mid-2012 with our supply commencing June 2013 and scheduled to be competed in July 2014. The site is due to start initial waste commissioning in late 2014; opening fully in early 2015.